Jeremy John Erickson was born on July 8, 1976 to Buddy and Debbie Erickson. He was their firstborn son and older brother to Mia (1978) and Patrick (1980). Jeremy was lovingly raised in Roseau, MN on a small grain farm where he came to love the fields, the sky, and the unstructured days. Jeremy’s family attended Rose Free Lutheran Church, and he was very much shaped by the summer camps he attended. Jeremy had a natural talent for music and for explaining the truths and evidences of God in new ways. As he grew older, his life as a God-fearing artist started taking form. 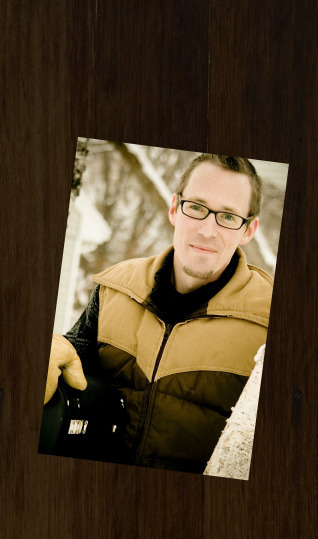 Upon graduating from high school in 1994, Jeremy moved south to the Twin Cities where he attended the Association Free Lutheran Bible School for two years. It was during these two years that he first met his future bride, Jenny (Aaserud), at Emmaus Lutheran Church, which became his home church (in the cities) for several years. Jeremy had already begun writing his own music, and would often teach and lead worship for youth groups and retreats. Following his time at Bible School, Jeremy attended Northwestern College, University of Minnesota (Morris), and had two separate positions as youth director at Our Redeemer’s Lutheran Church in Minot, ND and at Emmaus Lutheran Church in Bloomington. In 2000, it became evident to Jeremy that his music was inspiring others and worthy of his time, so he entered into music and performance full time. Jeremy spent a handful of years traveling through the Midwest and West Coast performing concerts and sharing stories. He spent a lot of time on the road and met many people who continued to remember Jeremy and his impact on their life. Throughout Jeremy’s lifetime, he produced several compilations of his own songs, which spoke of his faith, God, and everyday life. In the summer of 2001, Jeremy and Jen began hoping of a long future together. He proposed in October and they were married on January 5, 2002. They spent their first year of marriage traveling as Jeremy continued his performances. The following winter, Jeremy encountered his first struggle with illness (Crohn’s disease). Since Jeremy was no longer able to travel as often as needed, his gift of speaking became his primary occupation (at retreats, conventions, and local churches), as well as recording and producing music. On November 21, 2003, Jeremy and Jen welcomed their first son, Aedan Dominick (“little fire of the Lord”) into the world. Jeremy has enjoyed Aedan’s depth of insight, understanding, and his heart of compassion - he felt that Aedan’s life thrust him into a whole new understanding of his relationship with God. In May 2005, Jeremy was diagnosed with a Non-Hodgkin’s lymphoma, when Jen was eight weeks pregnant with their second son. Jeremy Elijah (Eli), who arrived on December 10, 2005, and was named to make a statement of what they believed, “The LORD is God, and the LORD will uplift” (God is God and God is good), amidst the hard season of life they found themselves in. Eli brought life to Jeremy’s life - his heart, interests, and personality deeply resonated with (and encouraged) Jeremy’s heart. The treatment for the lymphoma was long and difficult, but his cancer remained in remission. Amidst Jeremy’s recovery, he and Jen were blessed with a third son on June 4, 2008, Joseph Isaac (Jo Isaac), named as a prayer, “May the LORD add laughter”, in hopes that this new season of life would bring just that. Jo Isaac filled Jeremy’s heart in a uniquely special way, as he enjoyed parenting and loving him on a daily basis and attempted to teach Jo Isaac what being a true super hero is all about. Jeremy’s life was one of relationships and a desire for wholeness. He loved his family and friends deeply and he knew he was deeply loved. He also soaked himself in solitude and learning, which would give life to his writing and teaching - he presented Scripture in a way that left a mark on people’s hearts. His most powerful topics included suffering and the sovereignty of God, the importance of lament, the hope of the resurrection, and the love of his Abba Father. Jeremy’s illnesses, though extremely difficult, were often what inspired some of the insights and wisdom that he had come to share with others. In October 2011, Jeremy was surprised to find that his body (and it’s health) was once again compromised. He was diagnosed with MDS, a blood disorder caused by his previous treatments. He had a bone marrow transplant on May 1st, which ended up being successful in some ways, but also had its share of complications. Jeremy passed into the Father’s glory on Sunday, June 10, 2012 - forty days after his transplant, due to those complications. He entered his Sabbath rest – eternally. Jeremy saw the holiness of God and it’s beauty and knew it would one day be his to behold forever. He will be deeply missed by his bride and boys, his parents, siblings and their spouses, his nieces and nephews, his many friends, and the CityLife Church community. His arms reached wide, his talents blessed many, and his heart for God is forever imprinted in the lives of those who knew him.